As temperatures soar and wildfires burn, all sorts of strange creatures are drawn to town, including Vampirella. Help arrives in the form of four creatures who've just flown into town: The Starchild, The Demon, The Spaceman and The Catman. THIS BOOK FEATURES A GREAT BLACK & WHITE SKETCH VARIANT COVER E BY RODNEY BUCHEMI. STORY BY BRYAN HILL AND INSIDE ART BY RODNEY BUCHEMI. Canada and. Our hours are: Tues-Fri 12-8pm EST & Sat-Sun 11-5pm EST. THIS BOOK FEATURES A GREAT BLACK & WHITE SKETCH VARIANT COVER H BY RODNEY BUCHEMI. STORY BY BRYAN HILL AND INSIDE ART BY RODNEY BUCHEMI. Canada and. Our hours are: Tues-Fri 12-8pm EST & Sat-Sun 11-5pm EST. KISS / VAMPIRELLA Number 1. As temperatures soar and wildfires burn, all sorts of strange creatures are drawn to town, including Vampirella. Published by Dynamite Comics, 2017. Led by a driver who moonlights in the occult and haunted by satanic strangers dressed in black, KISS finds themselves drawn into a web conspiracy that threatens to kill rock 'n' roll itself. THIS BOOK FEATURES A GREAT BLACK & WHITE SKETCH VARIANT COVER E BY CARLI IHDE. COVER B: ART BY CARLI IHDE. Cover Artist: Carli Ihde. KISS / VAMPIRELLA Number 1. As temperatures soar and wildfires burn, all sorts of strange creatures are drawn to town, including Vampirella. Published by Dynamite Comics, 2017. THIS BOOK FEATURES A GREAT BLACK & WHITE SKETCH VARIANT COVER E BY ROBERTO CASTRO. ​KISS VAMPIRELLA #1 (OF 5) CVR F ROBERTO CASTRO B&W INCENTIVE VARIANT D. E.
§KISS VAMPIRELLA #1 (OF 5) CVR F 10 COPY CASTRO B&W INCV (Net). As temperatures soar and wildfires burn, all sorts of strange creatures are drawn to town, including Vampirella. Help arrives in the form of four creatures who've just flown into town: The Starchild, The Demon, The Spaceman and The Catman. 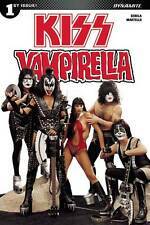 KISS VAMPIRELLA #4. COVER D COSPLAY PHOTO. Our comics are bagged with protective board. Cover: Photo. 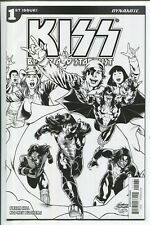 KISS / VAMPIRELLA Comic #1 JUNE 2017 Dynamite COVER A Variant By JUAN DOE! Dynamite ComicsKISS VAMPIRELLA #1, Juan Doe Cover A, nice copy! KISS VAMPIRELLA #1 (OF 5) CVR I 40 COPY DOE VIRGIN INCV. As temperatures soar and wildfires burn, all sorts of strange creatures are drawn to town, including Vampirella. Help arrives in the form of four creatures who've just flown into town: The Starchild, The Demon, The Spaceman and The Catman. THIS BOOK FEATURES A GREAT VIRGIN ART VARIANT COVER F BY STUART SAYGER. STORY BY BRYAN HILL AND INSIDE ART BY RODNEY BUCHEMI. Canada and. KISS VAMPIRELLA #2 (OF 5) CVR F 15 COPY DOE VIRGIN INCENTIVE D. E.
Rock 'n' roll isn't for the faint of heart. Jet-lagged, on the verge of recording a new album and stuck in the strange heart of Los Angeles, KISS are now up against an army of mysterious strangers who've kidnapped their old friend. KISS / VAMPIRELLA #5 - 2017. COVER D: COSPLAY. New Unread Condition - Near Mint/Mint. Photo by Erik Paredes. Model: Ashley Du. KISS / VAMPIRELLA Number 1. As temperatures soar and wildfires burn, all sorts of strange creatures are drawn to town, including Vampirella. Published by Dynamite Comics, 2017. COVER C By Roberto Castro and Chris O'Halloran. KISS VAMPIRELLA #3 (OF 5) CVR F 15 COPY DOE VIRGIN INCV. This item will be in stated condition or better. 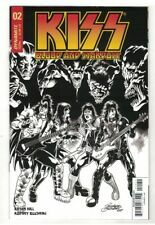 Up for sale is Dynamite Comics #1 KISS Vampirella. Book will be bagged and boarded. As temperatures soar and wildfires burn, all sorts of strange creatures are drawn to town, including Vampirella. Help arrives in the form of four creatures who've just flown into town: The Starchild, The Demon, The Spaceman and The Catman. KISS / VAMPIRELLA Number 1. As temperatures soar and wildfires burn, all sorts of strange creatures are drawn to town, including Vampirella. Published by Dynamite Comics, 2017. COVER A: Art by Juan Doe. KISS VAMPIRELLA #3. COVER D COSPLAY PHOTO. Our comics are bagged with protective board. Cover: Photo. KISS #6 (OF 10) CVR A PARILLO. (W) Amy Chu (A) Kewber Baal (CA) Lucio Parillo. NEAR MINT BAGGED & BOARDED! UP FOR SALE IS/ARE/AN/A. Blackwell's big secret is out. But are they too late to save the world they know?. KISS VAMPIRELLA #1 (OF 5) CVR C CASTRO. As temperatures soar and wildfires burn, all sorts of strange creatures are drawn to town, including Vampirella. Help arrives in the form of four creatures who've just flown into town: The Starchild, The Demon, The Spaceman and The Catman. KISS VAMPIRELLA #1 (OF 5) CVR D PHOTO. As temperatures soar and wildfires burn, all sorts of strange creatures are drawn to town, including Vampirella. Help arrives in the form of four creatures who've just flown into town: The Starchild, The Demon, The Spaceman and The Catman.